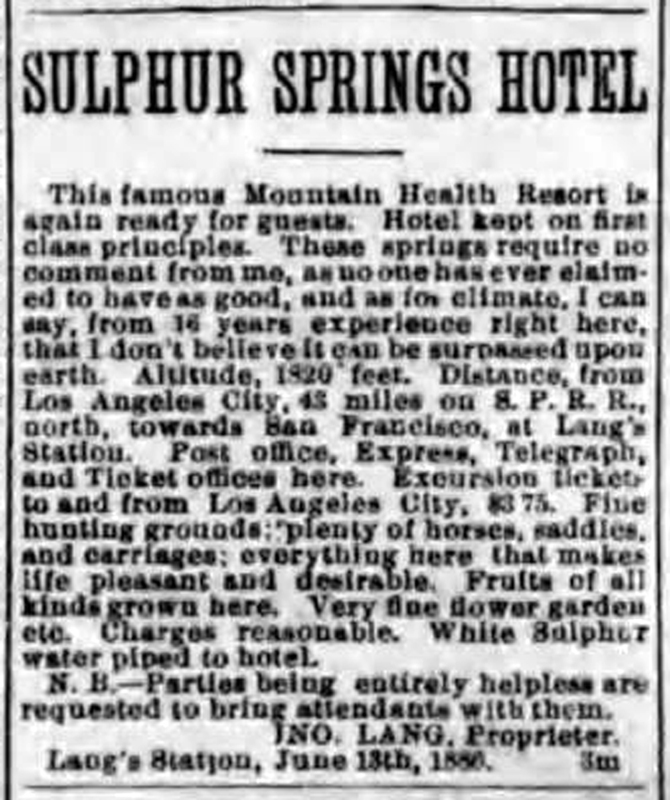 SCVHistory.com | Lang | Advertisement for John Lang's Sulphur Springs Hotel, 1886. Advertisement for John Lang's Sulphur Springs Hotel. Los Angeles Herald | Tuesday, June 15, 1886. This famous Mountain Health Resort is again ready for guests. Hotel kept on first class principles. These springs require no comment from me, as no one has ever claimed to have as good, and as for climate, I can say, from 16 years experience right here, that I don't believe it can be surpassed upon earth. Altitude, 1,820 feet. Distance, from Los Angeles City, 43 miles on S.P.R.R., north, towards San Francisco, at Lang's Station. Post office, Express, Telegraph, and Ticket offices here. Excursion tickets to and from Los Angeles City, $3.75. Fine hunting grounds; plenty of horses, saddles, and carriages; everything here that makes life pleasant and desirable. Fruits of all kinds grown here. Very fine flower garden etc. Charges reasonable. White Sulphur water piped to hotel. N.B. — Parties being entirely helpless are requested to bring attendants with them. Lang's Station, June 13th, 1886. Advertisement courtesy of Lauren Parker.